It’s a summer day in Mequon and there’s plenty to do outside – chase field mice, climb trees, catch bugs, lick yourself in the sun. 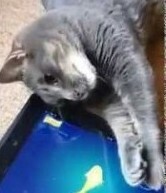 But instead of enjoying fresh air and exercise like generations of cats before him, Todd chooses to sit on the couch and play games on his iPad. Todd’s iPad addiction is not an isolated case and dozens of parents throughout Mequon are concerned with cat e-gaming. Feline psychologist Binks Mirkin has formed a local support group, Get Our Cats Off Tablets (GOCOT), to help parents cope with the addiction and help cats be more active. For now, the Stramchemps continue to allow Todd his game time, but try to balance his activities by giving him catnip and flicking little wadded-up balls of paper up and down the stairs. Next articleAre Mequon Cats iPad Addicts?